Colorful roses have lethal thorns, in an occasionally dozy first novel. The young-married Sheppards adore their new home, a charming 19th-century house in Steeple Tarrant, Wiltshire. Alex, the architect, admires the integrity of its design. Kate, whose thumb is genuinely green, is in love with what was once clearly “a garden of importance.” Unbeknownst to them, however, a seductive snake is about to slither into their Eden. 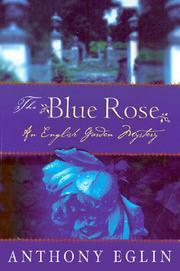 In an out-of-the-way corner of her walled garden, Kate stumbles on a rosebush she was certain could not exist, with large, perfect, velvety blooms of “an electric sapphire blue”—the blue rose as legendary in its own right as the Maltese Falcon, sought by floral alchemists throughout the centuries and deemed by contemporary botanists to be genetically impossible. The Sheppards are stunned and a little scared, and rightly so. Soon they’re overrun by opportunists from everywhere, hungry for the kind of commercial success the blue rose seems to promise. Among these are scoundrels who would resort to murder to own the rosy treasure. Eglin, a member of the American Rose Society, can probably count on a warm welcome by the faithful, if not by others.